Synonymous with the sea and the sea’s wild storms that created its dramatic coastline, Cornwall is a land of magic, myth and legend, of poetic writing and art. Its known history stretches back 5500 years and has witnessed Phoenician traders, pirates, smugglers and shipwrecks, the rise and fall of the tin-mining and fishing industries and a growing market in tourism which dates back to the days of Victorian villas built for long summer holidays. The origins of the coast path lie in Cornwall’s smuggling history. By the early 19th century smuggling had become so rife that in 1822 HM Coastguard was formed to patrol the entire British coastline. A coast-hugging footpath was created to enable the coastguards to see into every cove, inlet and creek and slowly but surely law and order prevailed and the smuggling decreased. By the beginning of the 20th century the foot patrols had been abandoned. Walking the coast path is one of the best ways to experience fully the sights and sounds that make Cornwall unique and special. As well as the sheer physical pleasure of walking, the sea breeze in your hair, the taste of the salt spray on your lips, you are treated to the most beautiful and spectacular views of this beguiling and sometimes hazardous coastline. The sky and the light change with the movement of even the smallest cloud over the sea that lies ultramarine and translucent on long hot summer days but becomes leaden and silver with mountainous white-crested waves in sudden storms. Watch for the seals that fool you by swimming under water for long periods, then bob up just when you’d thought they’d gone. You might see dolphins, too, or even a basking shark. Walking allows you flexibility over the distances you want to cover, your speed depending on your level of fitness. You can be completely independent, carrying all the basics of life – food, shelter and clothes – on your back, or book B&Bs ahead and walk with the knowledge that your creature comforts, hot baths and comfortable beds, will be waiting for you at the end of the day. As for rest stops, you’ll be tempted time and time again. Explore quintessentially Cornish fishing villages or take a quick break on the Isles of Scilly. Try to identify some of Cornwall’s profusion of wildflowers. Look into the little rock pools that are so full of life. Immerse yourself in contemporary art in St Ives. Investigate tin-mining history in a landscape so important that it has been declared a World Heritage Site. Try surfing or simply take a swim to cool off on a hot day. For food, feast on Cornish pasties and crab sandwiches as you picnic on a clifftop or beach; in picturesque cottage tearooms gorge on scones piled high with strawberry jam and clotted cream. Above all eat fish fresh from the sea, superb shellfish, lobster, crab and scallops. 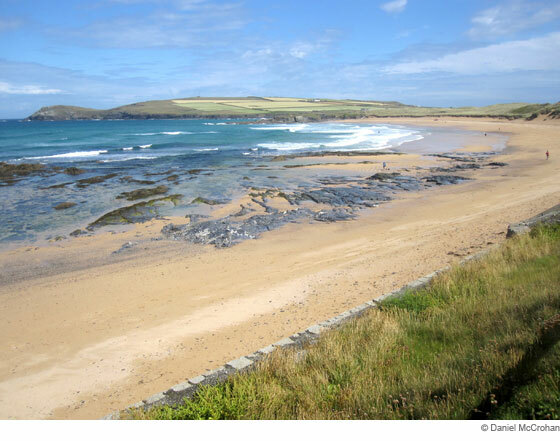 As well as ubiquitous fish and chip shops and beach cafés there are several top-class seafood restaurants in Cornwall, some run by famous TV chefs: Rick Stein has been in Padstow for many years and Jamie Oliver owns a restaurant in Watergate Bay. The Cornish coast is a holiday paradise that’s easily accessible, where you’ll enjoy some of the finest coastal walking Britain has to offer.